While ‘wining and dining' is part of the Vietnamese culture, you may now have to go to greater lengths to suitably impress. Senior businessmen in Vietnam prefer you demonstrate your wealth, power and skill by acquiring items of rarity and expense. Business is going well and you are about to be introduced to a prospective investment partner. You'll want to look sharp and be on your game. If you happen to be doing business in Vietnam, throwing in a free lunch may not be enough to clinch the deal. 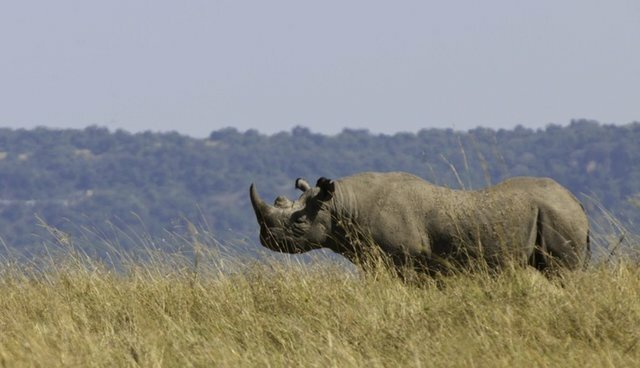 Despite being illegal to trade since 1975, recent research shows that rhino horn is the latest ultimate status symbol -- a gift demonstrative of respect, and of competence in negotiating deals and initiating business relationships. It could even ensure you preferential treatment. Whether it's a piece of rhino horn given as a gift, or the offer of a ‘millionaires detox drink' at the end of the evening, rhino horn is seen as the perfect accompaniment when striking that business deal. In 2013 Lynn Johnson, founder of Breaking The Brand, had the opportunity to interview several users of genuine rhino horn in Vietnam. She found that the users were wealthy, hence purchasing genuine rhino horn wasn't a problem, and they confirmed its value as "purely symbolic." At least one of the users was working for an international business and Johnson urges global firms developing operations with Vietnam businesses to consider "developing appropriate codes of conduct to avoid staff being involved in accepting a gift of rhino horn." Johnson also spoke with the wives of these businessmen who confirmed that they bought rhino horn for the relief of fever in their children and use with elderly parents who have cancer. Despite research that shows rhino horn to be no better for your health than chewing on your fingernails, rhino horn ‘peddlers' can be found in hospitals preying on the vulnerable -- selling horn as a substance that will relieve them of their ills. The problem with this illegal trade is that rhino populations are plummeting towards extinction, and fast. During 2013, 1,004 rhinos were killed in South Africa alone -- that's one every 9 hours. And along the border of the Kruger National Park and Mozambique nightly excursions are described as no different to "fully-fledged wars," involving heavily armed insurgents, helicopters, soldiers and mutilated animals. In mid April, the rhino death toll in the Kruger National Park sat at a staggering 184 for this year alone. From an estimated remaining rhino population of less than 30,000 in Asia and Africa today, these are significant losses. Johnson says that, "the current rhino poaching epidemic is being driven mainly by demand from Vietnam." When asked if current pro-trade arguments for rhino farming and a legal horn trade would meet the demand for rhino horn, she emphatically says, "No. There are simply too many potential customers in the pipeline. And, importantly, a farmed product is seen as inferior and no substitute. Wealthy consumers would continue to pay for the wild rhino horn. The poaching wouldn't stop." This sentiment is echoed by Paula Kahumba, Executive Director of the Kenya Land Conservation Trust and WildlifeDirect and Chairman of the Friends of Nairobi National Park, who states that "in reality there is no way that the supply from farmed rhino could come remotely close to meeting the demand, which is growing exponentially as consumers in Southeast Asia become richer." Save the rhino report that demand reduction strategies worked in Japan and Johnson considers that "well constructed demand reduction strategies can work to change behavior in Vietnam too, but they have to be pitched right." Importantly, the Vietnamese demand for rhino horn is not entrenched through tradition -- it is a ‘trend' going hand in hand with the country's increased economic development and the desire of individuals seeking material wealth and status. Using her expertise in behavior change, Johnson and her team are developing a demand reduction campaign specifically for the Vietnamese market, based on behavioral economics and social psychology. She explains that it would be beneficial to engage global business leaders in the campaign too, because "rhino horn users stated that they are influenced by the likes of Richard Branson and Bill Gates." Johnson hopes to roll out the campaign in the next two months and believes it will compliment current anti-poaching efforts. Another key in combating the illegal rhino horn trade may well prove to be a chemical one. The practice of infusing a toxin and visible dye into the horns of live rhino has been used in private conservancies for several years, and has recently been government sanctioned for use in national parks. If the treated horn is ingested it can cause severe nausea and diarrhea. Certainly not the ‘best medicine' for an already unwell child and definitely not the best ‘first impression' to leave a future business partner. While this should serve as a deterrent, unfortunately the Dinokeng Game Reserve lost their first rhino to poaching this month, despite the horns being treated. 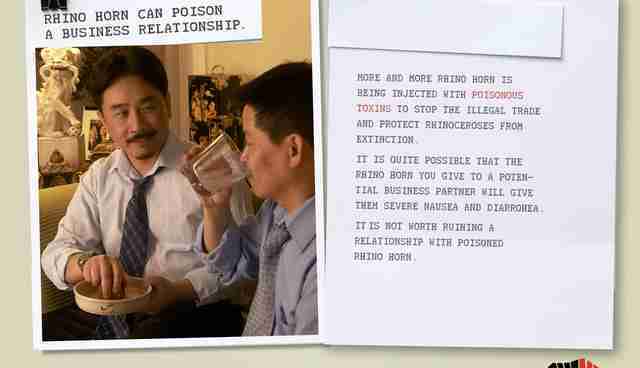 "Is it worth the risk of giving poisoned rhino horn to a potential business partner?"